Want something to really set your house apart? Have you been searching for a way to spice up your home and yard? Do you like a natural, yet functional look? 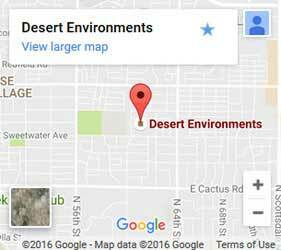 Then give Desert Environments a call. 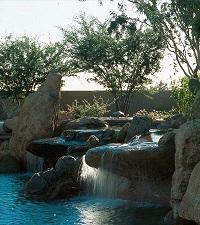 We do water features in Scottsdale that can completely transform your house. With over 25 years of experience, our knowledgeable landscaping company will work with you to create a design that fits your specific tastes, needs, and style. You'll be amazed at how much better your home looks when we're through with it! A water feature is an umbrella term for any piece of landscape architecture that uses water. Because it's such a broad area, you'll want to work with someone who's been in the business long enough to know how to install many types. 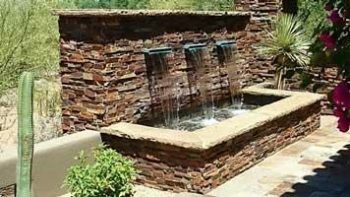 At Desert Environments, we're competent in many water features such as fountains, waterfalls, and ponds. And all of our installations are backed by some of the best warranties in the business! Fountains add excitement to your home. From multi-tiered cascading statues to a single dramatic sprouting fountain, you pick the style, and we'll handle the backend parts for you including installation. The gentle sound of waterfalls carry a feeling of peace through your landscape. Considering everything from the falls size to the volume, we'll make your waterfall give that particular look and feel that you've been searching for. A well-kept pond is always a delight. Whether you want it for appearances only or need it designed for fish to swim in, we can handle it. Simply tell us your plans for the fountain, what you want it to look like, and we'll handle the rest! Once we've put in your water features, you can choose to have us come by and make sure it keeps looking great. With landscaping services that encompass everything your yard needs, we're your full-service landscapers. And when we're through, you can cook on your custom barbecue in your outdoor kitchen on a cool night under our brilliant lights while your fireplace roars and you watch your gentle fountain spraying over your new pond. We're here to make that dream come true! Give us a call or contact us today to get started.